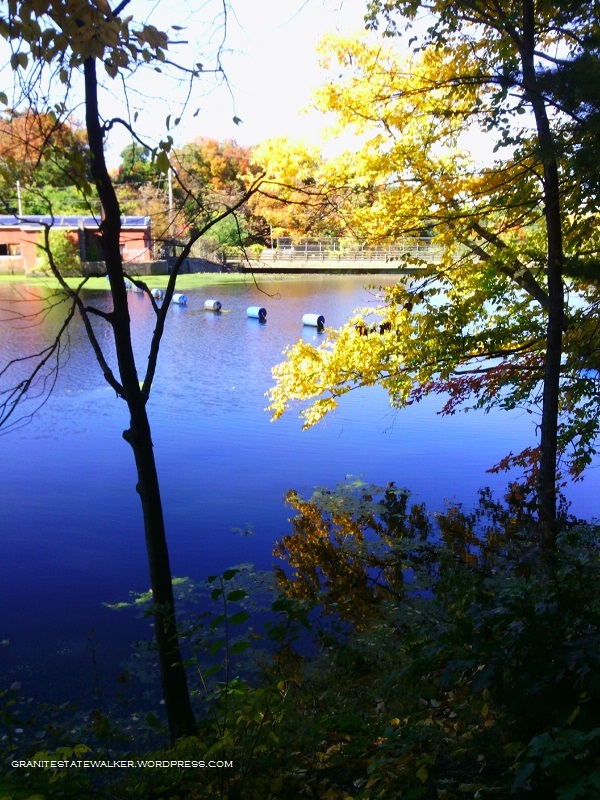 Look back over this blog’s decade of posts and one place gets mentioned in all seasons: the Nashua River Rail Trail. 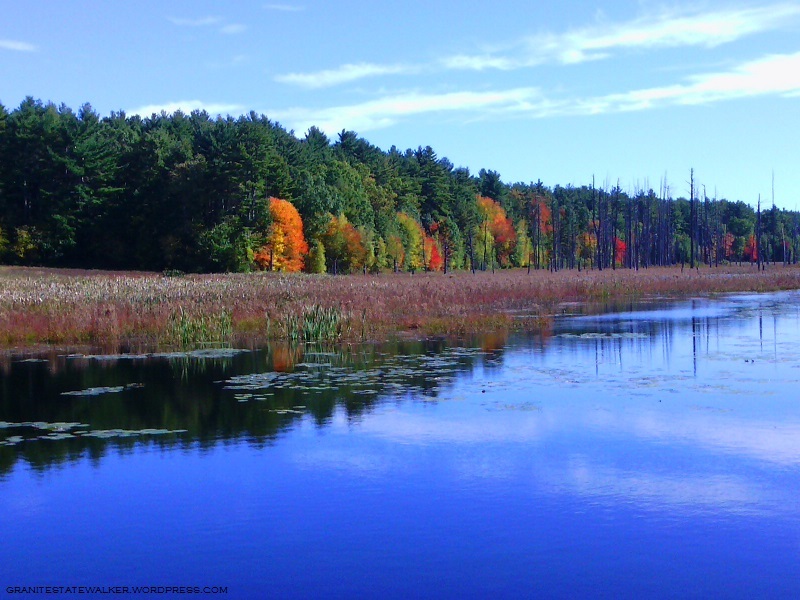 It extends 12 miles between Nashua, New Hampshire and Ayer, Massachusetts. I’ve biked it and walked it, and if I were so inclined I could skate on it or ride a horse. (Neither is likely.) I love marking the seasons. I like the sound of the skydiving plane overhead and the sight of the colorful chutes as the skydivers make their jumps. I like seeing what’s being planted at the farm in Dunstable. 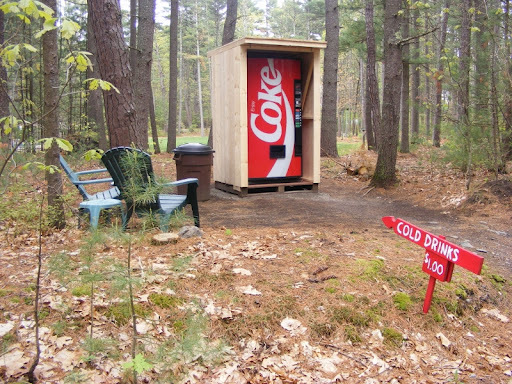 I am enchanted anew each time I see the soda machine that a trail-abutting family has set up. I LOVE the ice cream stand by the trail in East Pepperell. There are no bad seasons here. Saturday, and another nine miles on a very familiar path. I’m reminded again that I’m no photographer, especially when my camera is an afterthought on a mobile device. 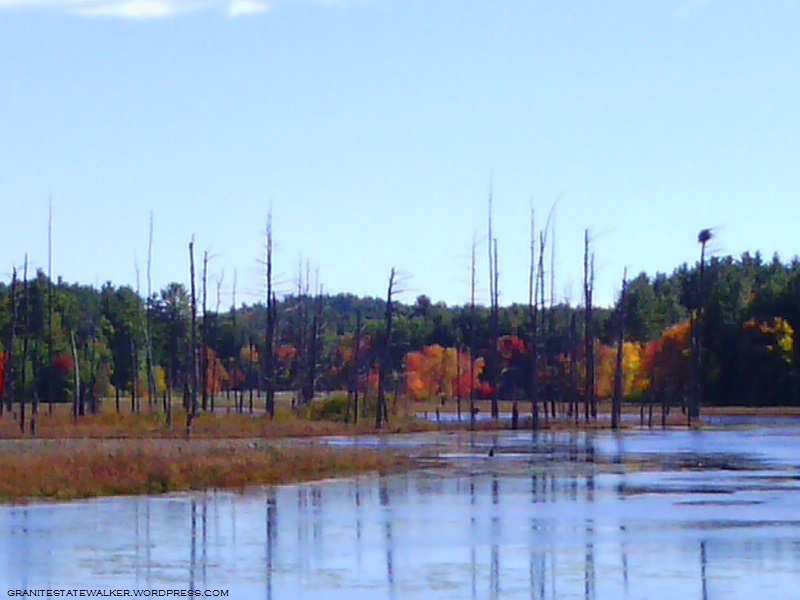 My pictures are generic New Hampshire foliage shots – but each one is of a spot I’ve seen in all seasons for more than a decade now, on unhurried walks like this one. When the Nashua River Rail Trail opened in 2002, an osprey nest was visible from the bridge over Unkety Brook. I look for it every year. It has taken a beating, and after one storm – was it the Halloween snowstorm of 2011? – it looked destroyed. Two springs later, the osprey were back. There’s a farm field bordering Unkety Brook on the north side. Nothing but corn stubble remains from this year’s crop, visible as the whitish ground cover in the center left of the photo above. Most years, I see butternut squash or pumpkins in that field, but this time it was corn. We had a very dry summer, and Unkety looked low in July and August. The water level looks better heading into fall. The glaring sun reminded me all afternoon that it would have been a good idea to wear a visor. No doubt that it’s autumn, though: the sun was much lower than at the same hour even a month ago, and it was fleece-pullover weather. The leaves on the trees edging the trail, as opposed to the trees along the nearby river and brooks, haven’t even begun to turn. I have an AMC River Guide from 1978, more useful at this point for history than for navigation. 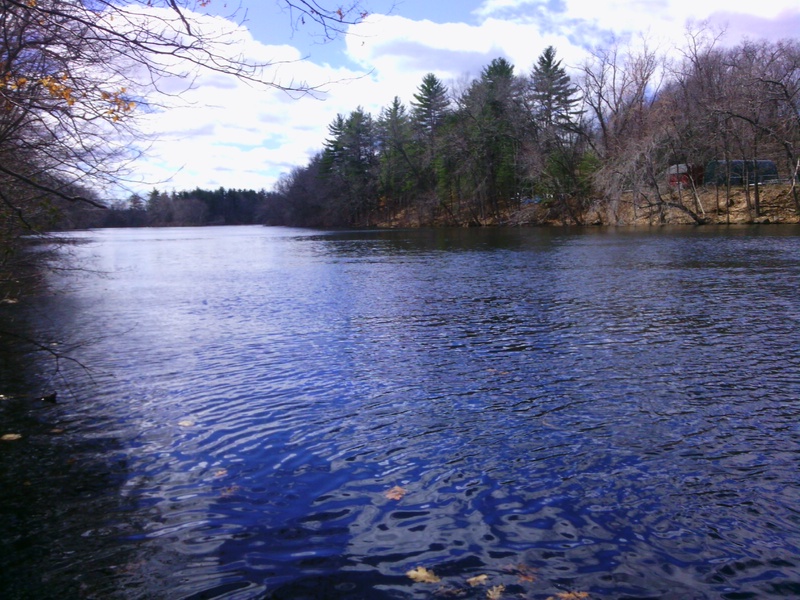 About the Nashua River in Pepperell, the writers fretted: “From [Groton] to East Pepperell, the river is not attractive, as the increase in water level has flooded swampland and killed the trees.” Much has changed in 30-plus years, and the area upstream from the modest little dam in Pepperell is now in my opinion the loveliest part of the river. Certain ceremonies must be observed: Columbus Day weekend marks season’s end for the ice cream stand in Pepperell near the rail trail, and I observed the occasion with a small-not-small dish of Moosetracks. No photo. Trust me – it was splendid. Conditions on the Nashua River Rail Trail are pretty good for the second week of April, especially in view of the exceptionally cold and snowy winter we had here in New England. 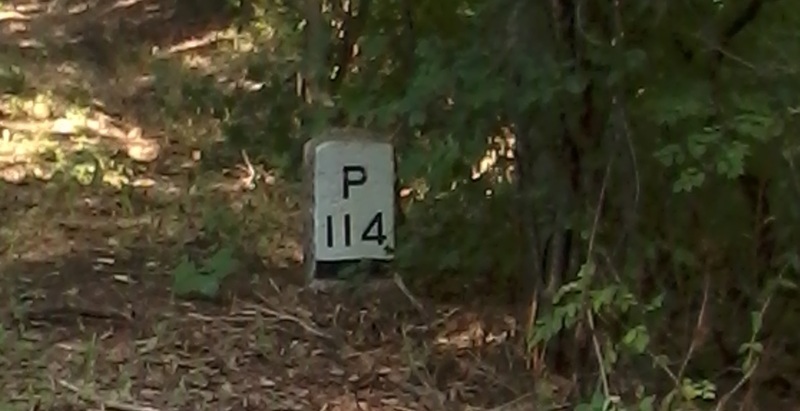 I scouted a couple of parking areas and then walked the stretch between MA 113 in Pepperell and Sand Hill Road in Groton. The trees aren’t yet in bud, so the river was the star of the show today. Gilson Road, Nashua: gate is open; ice and snow cover half the lot but about 20 parking spaces are clear and open. NH Route 111-A at Nashua/Hollis line: plenty of roadside parking. State line at Dracut: lots of snow was plowed into the far side of the lot, leaving room for three or four cars. MA Route 113 in East Pepperell: clear and open. Sand Hill Road, Groton: a snow pile covers about half the lot, but there’s still room for about ten cars. Pepperell: some patches of ice and snow, which should be gone soon with a few more 50-degree days. Groton: mostly snow-covered between town line and Sand Hill Road. About three inches of well-trodden soft snow make for an uneven surface, but it’s certainly passable on foot. It’s the beginning of another beautiful season on the NRRT. I’m looking forward to it. 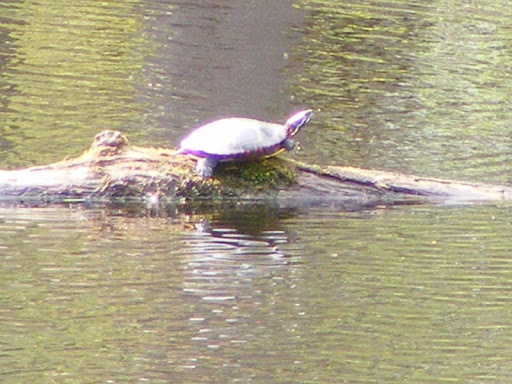 I headed south of the border into Massachusetts on the Nashua River Rail Trail for a walk through the Groton stretch. Of the four towns along the trail, Groton is where the history of the rail line is most evident. 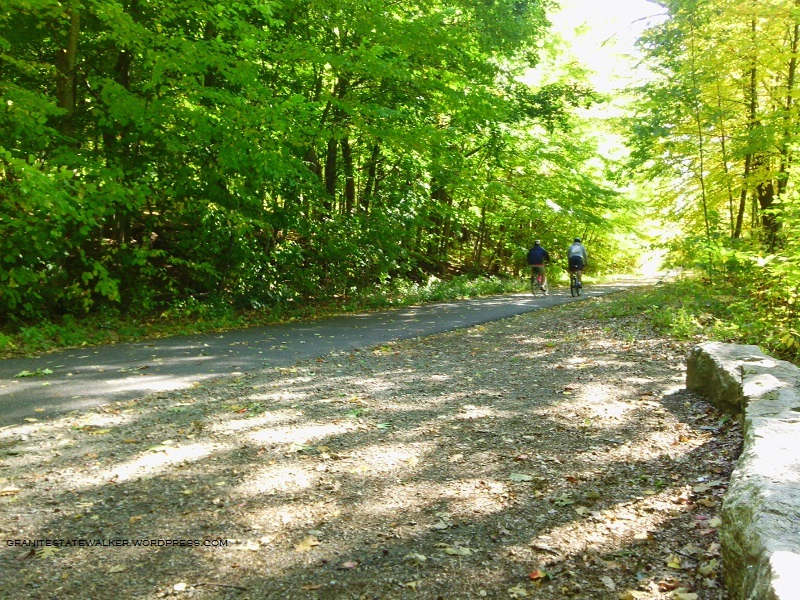 The town is also home to the most park-like section of the trail, situated within the J. Harry Rich State Forest. The harsh shadows in the photos are from the full midday sun, cheerfully blazing away on a summer day. The trail crosses over Rt. 119 in Groton on a nicely rehabbed bridge. 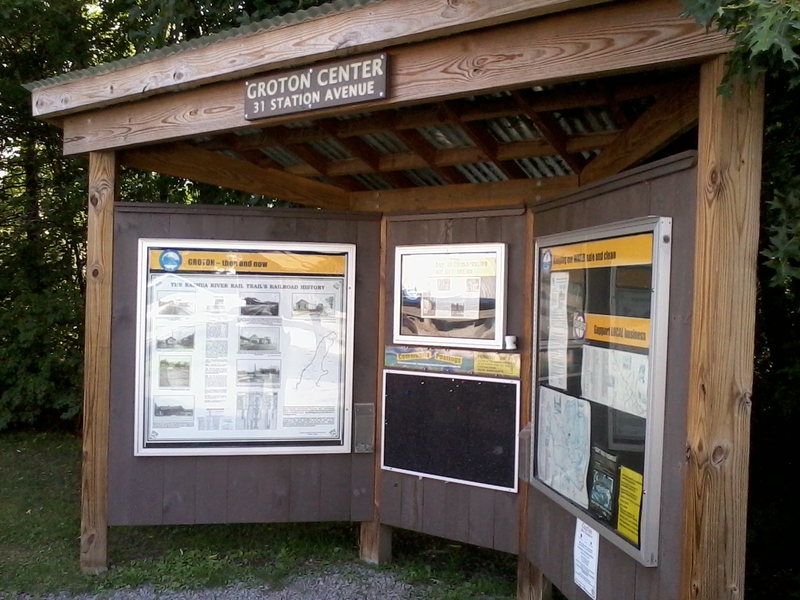 There are three trailheads in Groton, with the most parking available off of Broadmeadow Street. Smaller unpaved lots are at Sand Hill Road and Common Street. 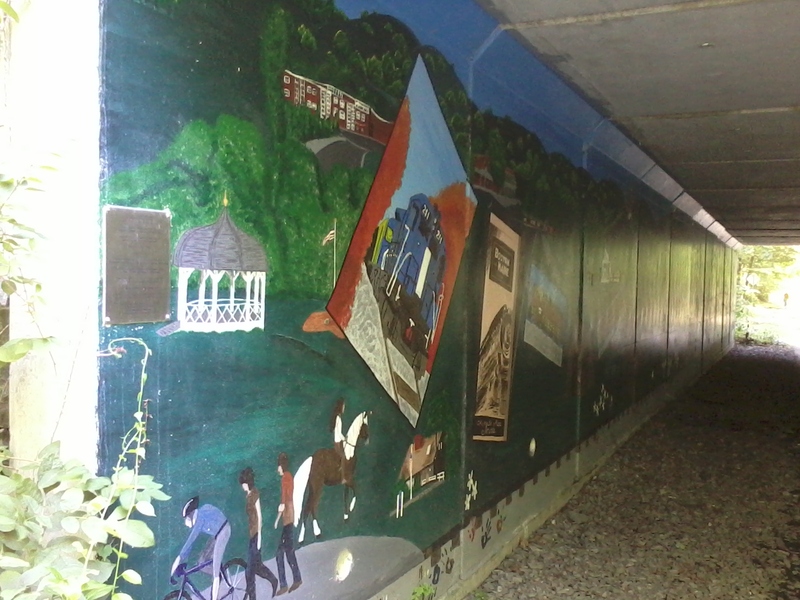 Local students painted the walls of the trail’s underpass at Rt. 225 with scenes of area history. There are no “facilities” along the way, so to speak, but near the trailhead at Broadmeadow Road are a couple of benches and an informational kiosk. The posted information and illustrations are worth a look. The best-maintained and most informative kiosk along the NRRT. Groton is one of those genteel places with strict zoning laws that keep commercial signs tiny. How am I supposed to find the nearest place to buy a large iced beverage? That kiosk near Broadmeadow has a bonus: a map of Main Street and the roads connecting it to the trail, with nearby businesses listed. That large iced beverage is only a short walk away. 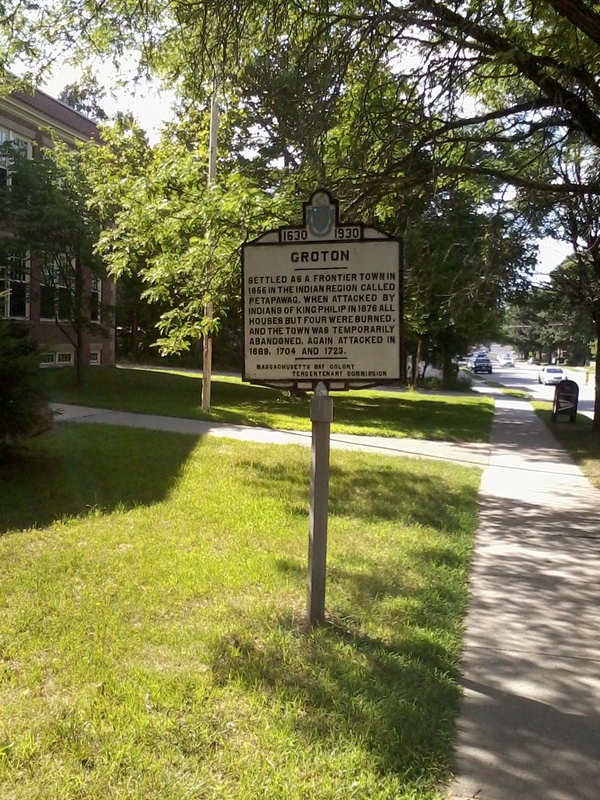 Marker on Main Street in Groton, a short distance from the trail. Some of the old rail line’s granite mile markers are still in place, and they’re kept painted by area volunteers. “P” is for Portland, Maine, and “W” is for Worcester, Massachusetts – once upon a time, the two ends of a line of the Boston and Maine Railroad. 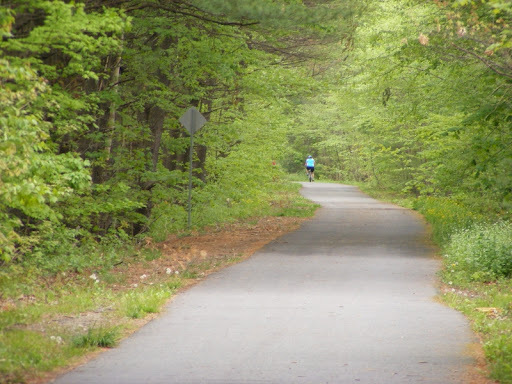 Of the 120 or so miles of that old line, twelve miles now make up the Nashua River Rail Trail. “P” is for Portland, Maine, 114 miles from Groton by way of the old Boston & Maine rail line. Crowning the day was an abundance of Queen Anne’s Lace all along the trail. 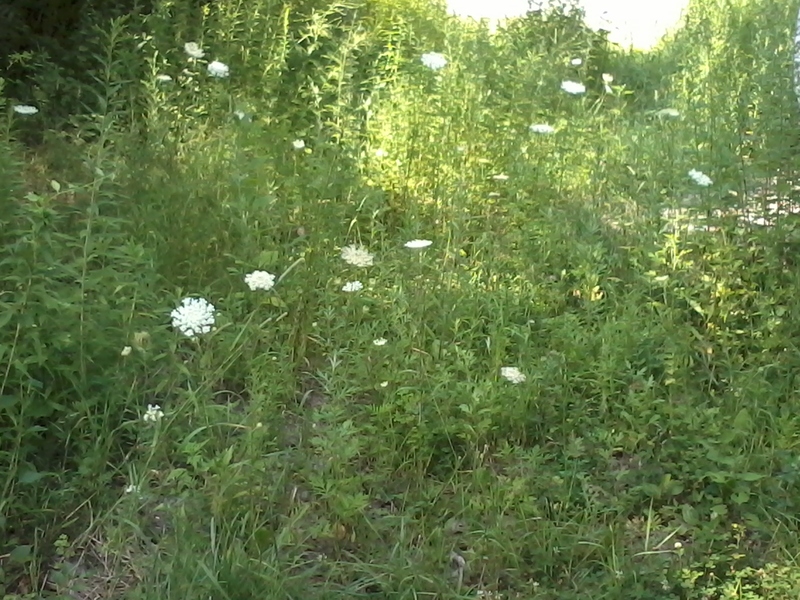 Queen Anne’s Lace is at full strength in July. No columbines yet on the Nashua River Rail Trail. I knew today was kind of early in the season, but I was eager for the year’s first visit to this old friend of a trail. I spotted a columbine along the way in the Dunstable stretch about three years ago. The following year, a second plant sprang up a few feet away. Since then, I haven’t been able to spot them – pulled up? died? I don’t know, but I look for them anyway. 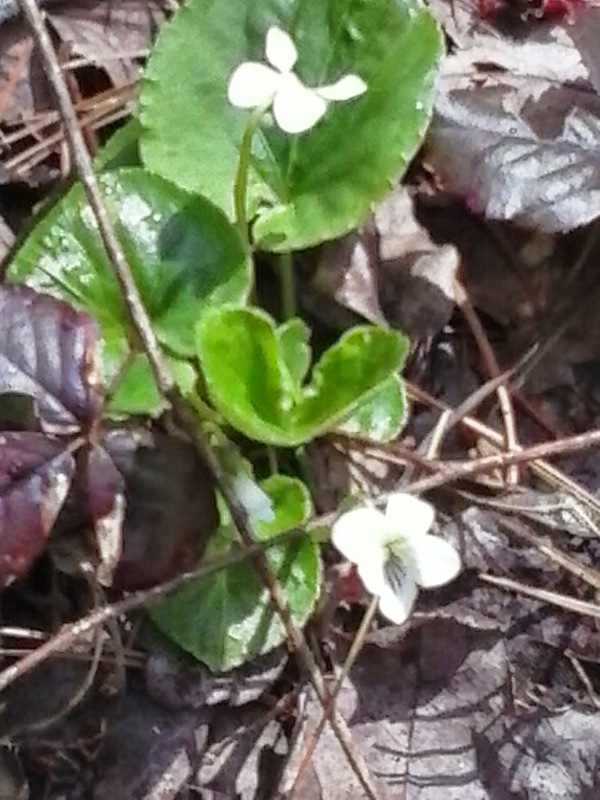 Blossoms were few this weekend – a dandelion, and a few of the tiny violets that I refuse to call weeds even when they’re all over my lawn. The deciduous trees along the trail are just beginning to leaf out, and little pines are taking root in the shadow of big ones. The skunk cabbages down in the wetlands are the brightest green in sight. Spring cleanup has already been done by some wonderful group, probably volunteers, who have moved the winter’s deadfall off the pavement. 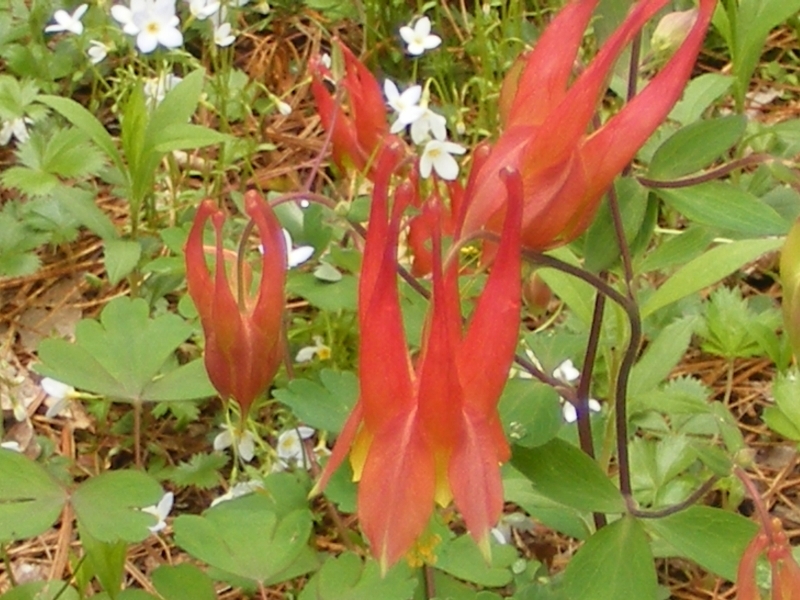 Columbine, seen along NRRT in 2012. Most flowers are still a few weeks off, and yes, I’m impatient for them. Still, I liked what I saw today – if not for its own sake, then for what it means for the coming season. Clumps of green grasses and ground cover are poking up through the dead leaves along the edge of the trail. The farm in Dunstable has sheets of white row-cover already out on one field, so something’s been planted – will it be pumpkins or butternut squash this year? The soda vending machine that one whimsical family sets up annually in their back yard adjacent to the trail is back, and the price per soda is unchanged at $1. No plane from Skydive Pepperell. I’m not sure if that was due to the weather or the calendar. From late spring through fall, I’m accustomed to the every-20-minutes rhythm of the Twin Otter as it takes off from its airstrip near the trail, makes lazy circles up to what I’m told is 13,000 feet to let out the skydivers, then descends and returns. Weekend traffic was far below summer levels. Very few Type A’s, as I call the cyclists that seem to be on a mission, zooming past everyone else, calling out a courteous but abrupt “On your left!” as they fly by. This was a family day, featuring kids on training wheels or on very shiny bikes that were probably under the Christmas tree. One high-spirited six-year-old had a BMX-style helmet that probably cost more than his bike. No helmet or bike for me this weekend, just sneakers and a hankering for wildflowers. They’re not out yet, but I’ll see them soon. 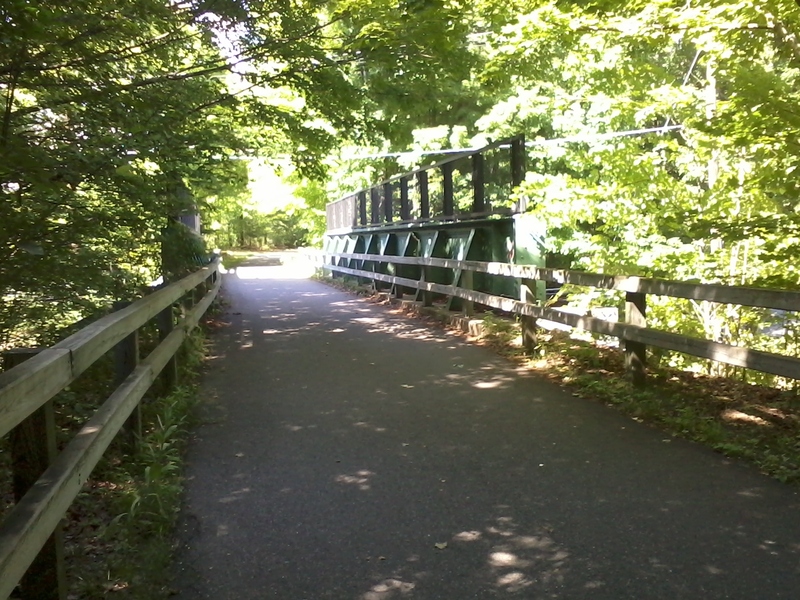 Back to the Nashua River Rail Trail today. This is still one of my favorite places, in all seasons. 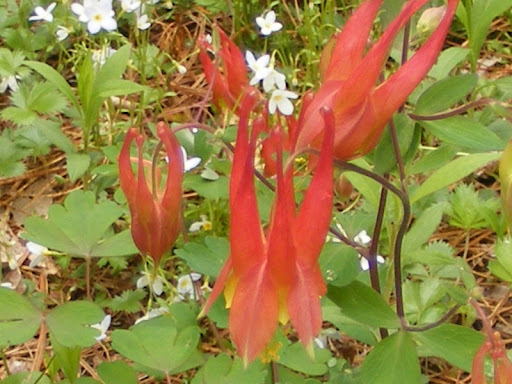 After a dry winter & early spring, recent rains have brought out the wildflowers along the trail, including the columbine pictured below that will be gone by my next visit. Today’s walk was from Gilson Road in Nashua to Rt. 113 in Pepperell. Hardly any traffic on the trail today!